rocillam has no other items for sale. 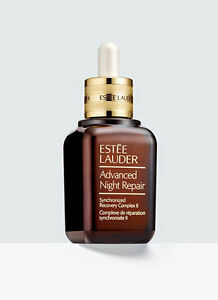 The Advanced Night Repair Synchronized Recovery Complex II by Estee Lauder will leave your skin rejuvenated. It is formulated to make a woman's skin and feel young, nourishing it with a palette of salutary elements. This serum's well-balanced formula and anti-aging properties help wipe away the years. Additionally, it should be applied gently on the face and neck. Thanks for a great transaction and fast shipping! great result. it definite to worth to buy. A++++ Seller. Great product & fast shipment. Fake product. Beware! Do not purchase! Dissatisfied and disappointed, not real serum. Fake, smells different than the . Bottle print, font, tip, cap, fragrance differ from large retailers. Is it real? this is fake!!! be aware!!! If you can get a deal its worth it. Otherwise full price or close to full price,, don't do it. There are a lot of products on the market. Get trial sizes until you find what is right for your skin. I see noticeable shine. Light weight moisture. I'm only 2 weeks in on using this product. I'd love to write a better review in my results on month 3 so i could be more informative. The texture is gel like. Cooling to the skin. Not heavy. Drys quickly. Smells nice. This serum is excellent. I have used it for decades. In both an area of average humidity and in a very low humidity area. It works in both places. i usually put it on under a good night moisturizer. If my skin is unusually dry, I will even use it under my day moisturizer. It is very expensive to buy in a retail store. Here, it is much less costly. I bought the sample serum before I move on to buy the larger size so i wouldn't make a mistake in purchasing. The serum works great in my skin, and it helps my skin to keep its moisture and maintain its tenderness during the dry season in winter. I do feel a healthy skin the next morning i wake up. I use three to five drops every night, and a bottle lasts for around a month. This is a really good price considering the effect on skin and for the days it lasts. Have used it for a couple of years and LOVE IT !!! It does NOT break me out....which concerned me before trying it. I use it every day or every other day. I have very sensitive skin and it is like a dream come true. Great for moisturizing and skin repair. I highly recommend it !